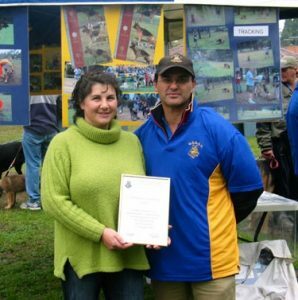 Dr Kate Murray & Mountain Ranges Veterinary Clinic GSDCV President Dom Cafari (left) and Northern Branch manager Vince Ebejer present Dr Kate Murray with a certificate acknowledging veterinary work around the Kinglake mountain area during the 2009 tragic Black Saturday Fires. 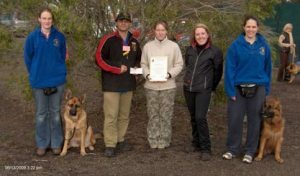 Following the terrible bushfires on February 7th 2009, all branches and members of the GSDCV fundraised to assist those who had worked so hard to treat the animals and wildlife affected. Several members of the GSDCV were impacted by the fires in the Bendigo, Gippsland and Kinglake areas, and we appreciate the contribution and support of these great organisations and helpers to all involved. Our small donations will assist these organsiations and individuals to continue with their ongoing work with all animals. The presentations acknowledged her work in treating a large number of injured domestic animals and wildlife around the clock in very difficult times. 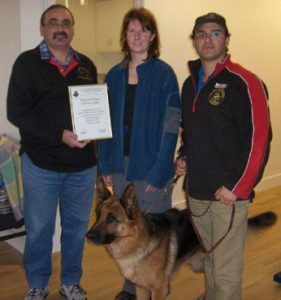 Kate was assisted by a number of volunteers including Virginia Scully and GSDCV members Phil & Ros Vincent. Unfortunately the business Kate originally worked at was destroyed. Kate has now started her own practice called the Mountain Ranges Veterinary Clinic. A combined donation of $1771 from the GSDCV and its membership will help equip this new practice. They were also able to assist other vet practices in treating other injured animals by proving additional supplies to them. The GSDCV was pleased to donate $1500 to Lisa and the other senior partner Dr Malcolm Ware to help cover some of their expenses in relation to that important work. Vince Ebejer and Northern Branch members present Narrelle Smith & Fiona Rowley from Wildlife Victoria with a certificate acknowledging their amazing job during the bushfires in rescuing, transporting and rehabilitating injured animals. Wildlife Victoria also helped to get feed to the affected areas for any animals that survived as well. A donation of $850 made by the GSDCV will help this volunteer group continue their good work.